The Country Celebrant: The Country Celebrant: Wedding Fayre or Fair! 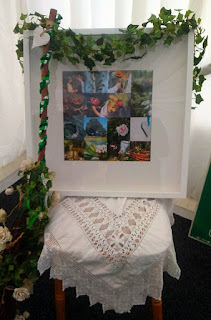 The Country Celebrant: Wedding Fayre or Fair! The Country Celebrant in delivery mode! Last Sunday dawned warm and bright, a perfect, bucolic country day to spend in idyllic surroundings talking to people who are embarking on the great adventure of "tying the knot" with the love of their life. 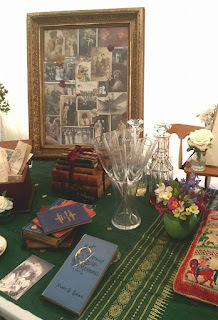 There were a number of stalls promoting formal wear for both the bride and groom, delicious things to eat, beautiful flowers, stylists and photographers. Jane Arnold - the eccentric book lady and civil celebrant and I shared a table. Our styling came together seemlessly - vintage pieces mixed with fresh flowers and all the paraphernalia associated with being a Celebrant. We were impressed by the response of those who spoke with us - we are educating and enthusing people all the time. 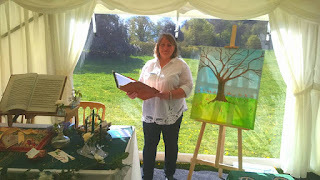 There seemed a desire to make the wedding day more affordable and meaningful and less ostentatious than it has on other occasions and I wonder if that is because of the nature of the setting, in a country garden under the hanger in beautiful Hampshire. There was an opportunity to showcase what we do as Celebrants during the afternoon. Unrehearsed and impromptu we held a hand-fasting with a model who was showing off the bridal wear and a very dapper groom. They entered into the spirit wholeheartedly and Jane read an appropriate piece of poetry. 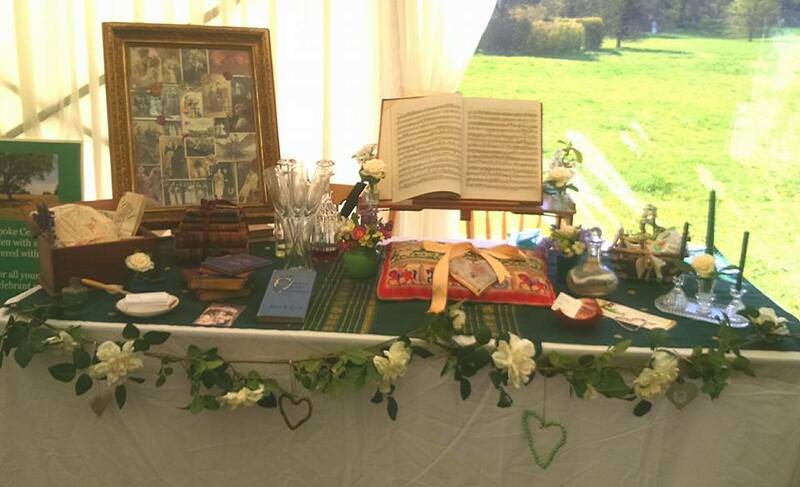 There was a buzz around our stall after the hand-fasting, showing people what we do is undoubtedly the way forward. I hope that the warm response we received is translated into some truly magical ceremonies. Both Jane and I would love the opportunity to work at Gilbert White's House, in the Field Study Centre or the gardens there; there is a timeless quality and an authenticity to the surroundings that fits the bill very comfortably.